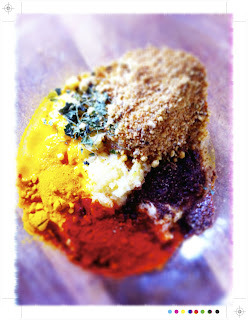 I came across this recipe by Soma over at e curry. 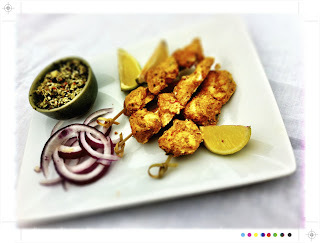 If you are looking for Indian inspired dishes you should head over there and check it out. Beautiful pictures and wonderfully fragrant and full of flavour recipes. 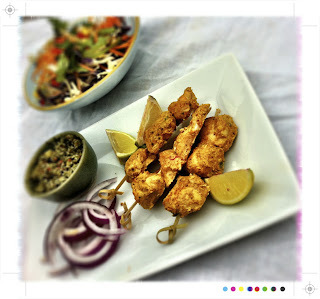 And when one is trying to be healthy the perfect place to check out more interesting ways with chicken! Straight away the photo drew me in and then reading through all the wonderful spices it was a done deal. It does take a little time, being best to let all those wonderful flavours marinade the chicken over night. However, once that is done all that is required is a few minutes grilling or baking and you have tender, aromatic little morsels of chicken or you could serve them as little kebabs. These would be a great way to feed a crowd at a Summer BBQ. The real Indian name would be Murgh Tikka, the murgh meaning chicken and tikka meaning little bites. This dish originates from the northern region of India and is strongly influenced by the Persian Mughals. The land they once ruled is now India, Pakistan, Bangladesh and Afghanistan however their influence can still be seen today through their architecture, think the Taj Mahal and their food, the flavours of chicken tikka. It is quite a list of spices but any Indian spice shop should be able to help you. I headed to Mahadeos on Virginia Ave in Auckland. A veritable treasure trove of herb, spices and any Indian condiment or ingredient you can possibly imagine. Mr Mahadeo was very helpful and as I was his first customer of the day he made me up a batch of his own special garam masala. Just buy what you need rather than large quantities which may just end up lurking at the back of the pantry. Traditionally they would be cooked in a tandoor but an oven will do. If using bamboo skewers soak them in water for 20-30 minutes before grilling. 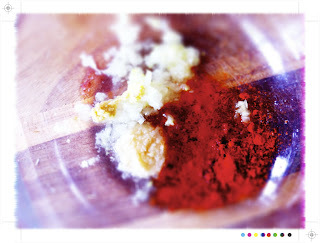 Place all the ingredients for the first marinade in to a bowl, mix to combine and add the chicken pieces. 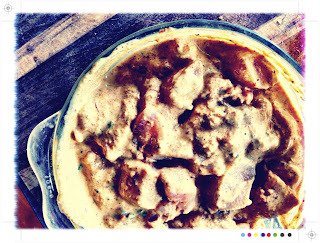 Massage the marinade in to the chicken pieces, place in the fridge and leave to marinate for an hour. For the second marinade warm the tablespoon of milk and add the saffron to it. Give it a little stir and allow the saffron to infuse the milk. Heat half a tablespoon of oil in a frying pan. You want it hot but not smoking hot. Crush 1 teaspoon of the ajwain seeds by gently rubbing them with your finger in the palm of your hand and then add them to the oil. Over a low heat, add the chick pea flour and constantly stir it with a wooden spoon until it turns just a shade darker and it releases a nutty like aroma. It may look like the flour is lumping up a little, but don't worry it is okay, just keep stirring. Place the yoghurt in a medium bowl and give it a whisk. Add the ginger paste, garlic, garam masala, 1 teaspoon crushed ajwain/carom seeds, kasuri methi, turmeric, black pepper, red chili powder, salt and the food colouring if you are using. Next add the saffron milk and add the toasted chickpea flour . Whisk everything together until you have a smooth lump free mixture. 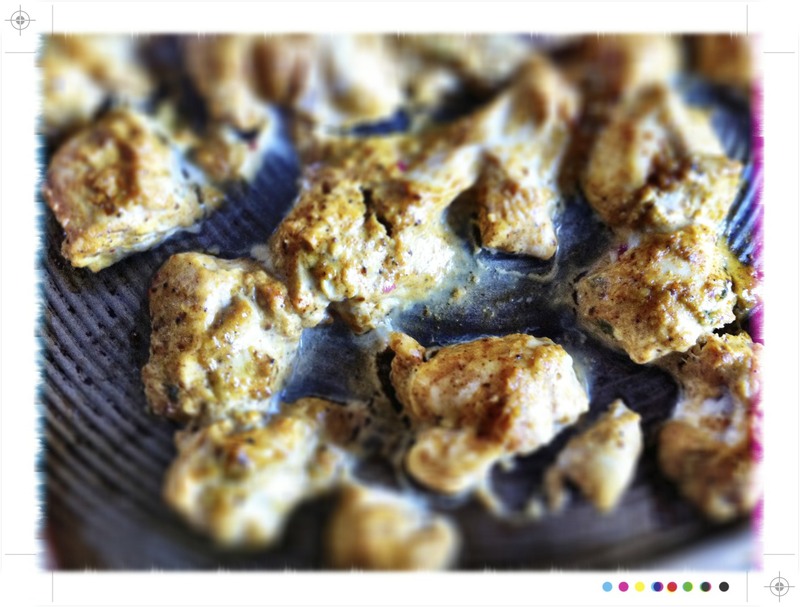 Spoon the marinade over the chicken and stir really well so that every piece of chicken is coated in the marinade. Place in the fridge and let it marinade for at least 4 hours or preferably overnight. Just before cooking the chicken rub the skewers with some of the marinade so they kind of coat the skewers. Skewer the chicken cubes on to the skewers, 6-8 for large skewers or 2-3 for appetiser size. Or for an even easier method just place them all on a baking tray. If baking pre heat the over to 200C - 215C / 400F - 420F. As we all know each oven is different. Even with my antiquated, slightly broken seal oven 200C was right. Place the chicken on a baking tray, skewered or not, and bake for 10-15 minutes. We are looking for cooked through, but still tender and juicy. While cooking baste a couple of times with ghee pr oil and turn them over at least twice. For a little char you can pop them under the grill for just a moment. For grilling, cooked covered for about 5-8 minutes. Uncover and cook until almost done. Again baste generously with ghee or oil, turn them over and cook until done. For stove top lightly grease a skillet or a cast iron grill pan. Place the chicken in the skillet or grill pan and cook for about 5-8 minutes at a medium heat. Turn them over and baste them generously with ghee/oil a couple of times and cook all sides for another 5 minutes or until the meat is cooked through and tender. If you want it charred and brown bits, increase the heat at the end of the cooking and cook at high heat turning them around for a few more minutes. Again be careful not to overcook it as tough and dried out is not good. Serve the chicken immediately. 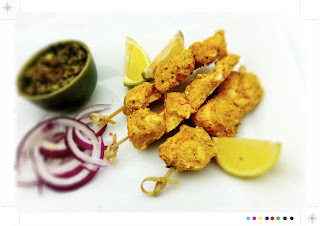 Drizzle with a good squeeze of fresh lime juice and serve with some sliced red onions and more lime wedges. You can also sprinkle them with Chat Masala if you are using. 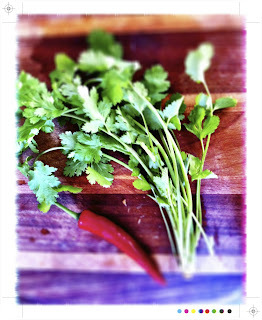 And on the side whip up a little Mint Cilantro Chutney. This would be great with any grilled meat, fish or even vegetables and wonderful fresh and vibrant dip with some toasted pita or poppadoms on the side. It is bright and fresh with a good hit of heat from the chilli. Remove the tough stalks of the fresh herbs and place everything in a blender or food processor. Blend to a smooth consistency. Serve as condiment, dip or spread. I used my mini blender so it wasn't quite smooth but it still tasted wonderful and I like a little texture. The chicken is full of flavour, fragrant and aromatic, lots of layers and nothing too overpowering. 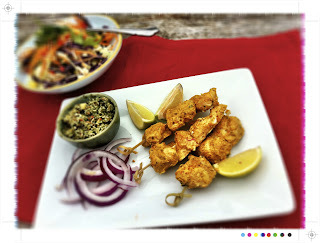 The lime provided a bright fresh acidity and the chaat masala lifts it all. It is a little sweet and a little sour. Usually it includes dried mango powder, cumin, coriander, ginger, salt, black pepper and chilli among other things. I can see myself sprinkling all sorts with the chaat masala. 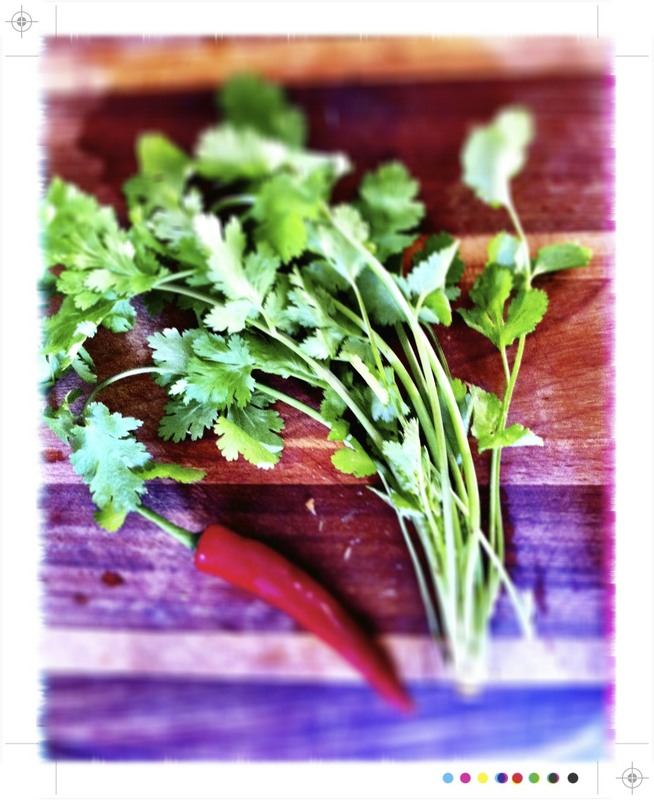 The mint and coriander chutney is fresh, with a little heat and then mellowed by the sweetness of the coconut. Good things do indeed take time. These look so tasty! Great photos Mairi. I do love Indian food! What beautiful photos...I especially like the spices. @timeforalittlesomething.com Thanks - they were pretty good! Oh, Mairi! I, too, LOVE Soma and her blog. Your photos are wonderful and so vibrant! We love Indian cuisine and I don't know why I am so intimidated to cook Indian dishes at home. I am very happy to read your articles it’s very useful for me,and I am completely satisfied with your website.All comments and articles are very useful and very good. I do agree with all the concepts you have offered in your post. They’re very convincing and will definitely work. Still, the posts are too brief for beginners. May you please lengthen them a little from subsequent time? Thank you for the post. @Annapet Thanks Annapet, love a little Indian, such a great way to spice things up.